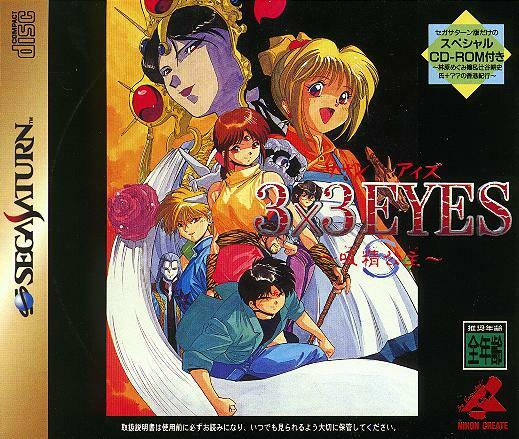 Many role-playing games and interactive comics have been based on 3x3 Eyes, and there seems to be a 3x3 Eyes game for every video game system imaginable. Unfortunately, these games are only available in Japan, and they generally require a Japanese game system and knowledge of the language to be played. More details about the individual games, including some translations, will be added later. This seems to be the first 3x3 Eyes game made. It is a roleplaying game with the traditional top-down view and super-deformed characters, and some nice cut-scene graphics. The plot is somewhat similar to manga vol. 6. 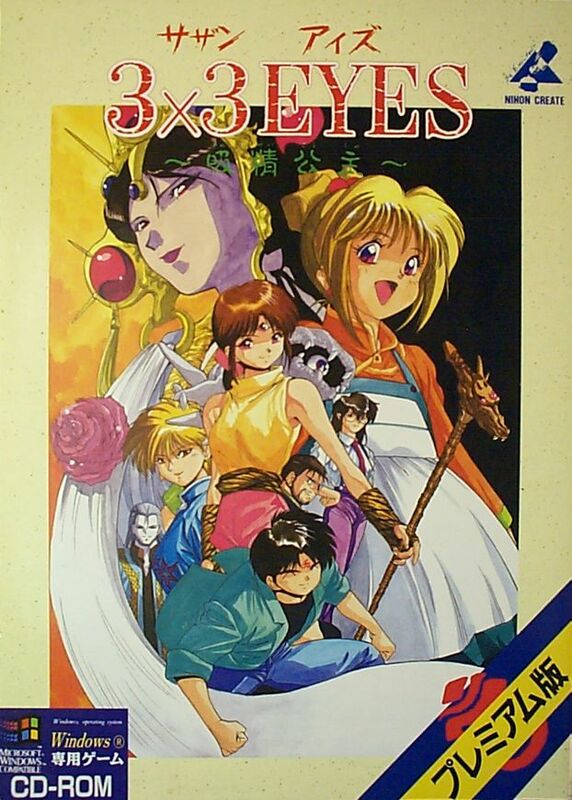 This is another RPG game, this time based somewhat on volumes 3-5 of the manga (the Seima Densetsu story arc). There is only 1 CD even though the game comes in a double-CD case. Perhaps they needed the extra room for the detailed 52-page manual and the mini-poster with the cover art on one side and a chart of the game monsters and items on the other. This game is a port of the first Nihon Create game for PC-98, described below. It comes with an 5-minute promotional video showing scenes from the game. This game is described in detail in the CD & Graphics hint book mentioned on the Books page. This is a side-scrolling action/adventure game, and it is a lot of fun to play. This game is a 2-CD interactive movie/RPG. It is a port of the second PC game by Nihon Create. The Saturn game is a newer version of the Playstation game. It comes on three CDs and has several improvements, including new animation and voice recordings as well as brighter colors. 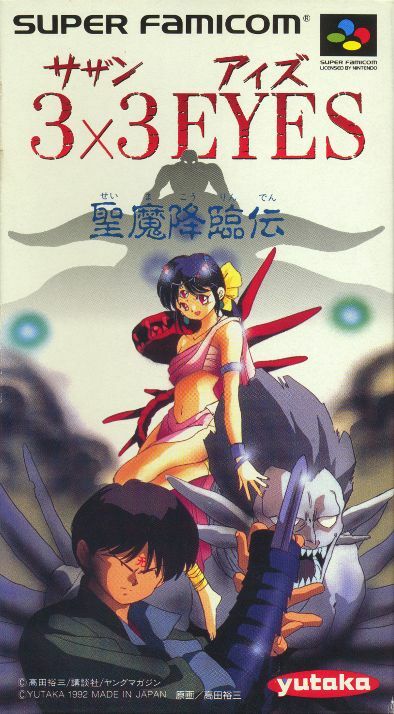 The third CD contains some special features, like a product database and a tour of Hong Kong with voice actors Megumi Hayashibara and Kouji Tsujitani. 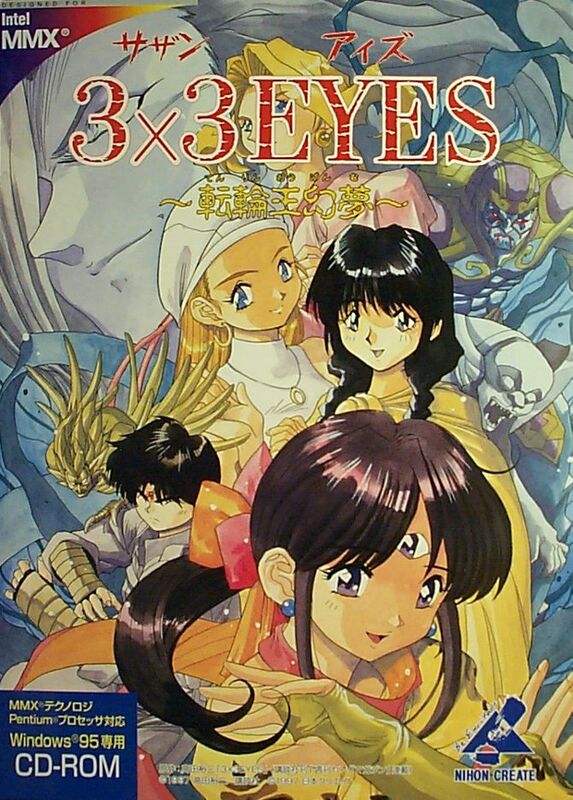 A trilogy of 3x3 Eyes computer games has been created by Nihon Create. All three of these games are of the "digital comic" adventure game variety, which is much like interacting with an anime episode. A lot of the information below came from Nihon Create's home page, which has now unfortunately been redesigned. These games have been ported (with modifications) to many different platforms, as shown in the list of console games above. The titles are ~Sanjiyan Henjyo~ (Sanjiyan Metamorphosis), ~Kyuusei Koushu~ (Soul-Draining Lord), and ~Tenrin Oh Genmu~ (Illusory Dreams of the Reincarnated King). 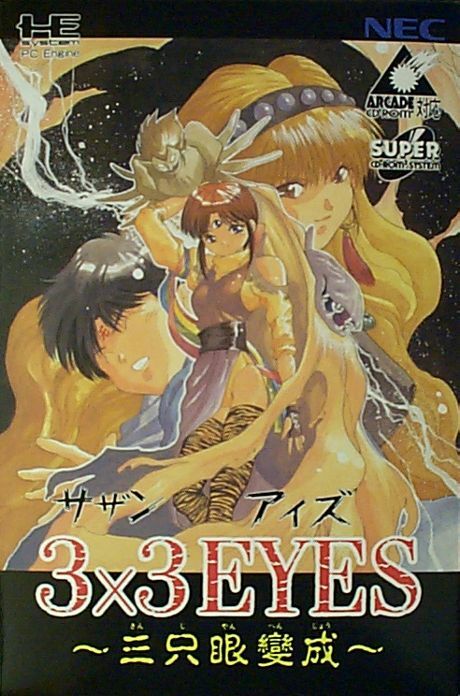 This is the original 3x3 Eyes game for PCs, actually the NEC PC-98 which is incompatible with IBM machines. The game comes with a Hi-Fi VHS promotional video, which is likely similar to the video included with the PC Engine version. This is an add-on for the Sanjiyan Henjyo game above, with programs for viewing the game graphics and listening to the music. It also discusses the making of the game and other information, and there are a few mini-games included as well. This is a port of the PC-98 game above to the mysterious FM-TOWNS system. Obviously it took Japan a while to jump on the IBM-compatible bandwagon. This game also comes with a 5-minute promotional video. This is basically the FM-TOWNS version of the Fruits Pack. It should be more useful since the CD-ROM version of the game should have more graphics and sound. Of course, you need an FM-TOWNS to run it. 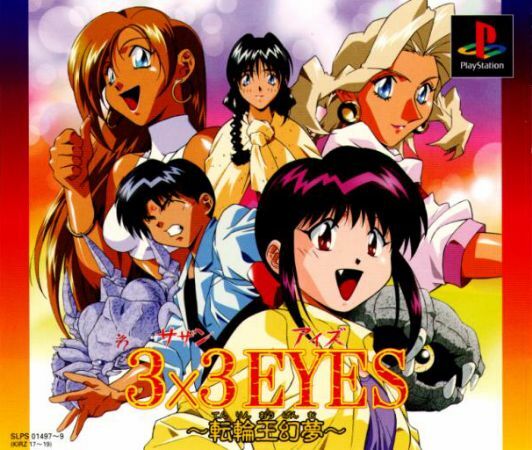 This is the PC version of the second 3x3 Eyes game, and the first game available for Windows. As you can see, it is rather expensive. There is also a Premium version (13800 yen) which includes a character sketch book and a 12-track audio CD with game music, character introductions, and voice actor interviews. This is a new Windows 95 compatible version of the original PC-98 game. It's also a bit cheaper, I suspect. 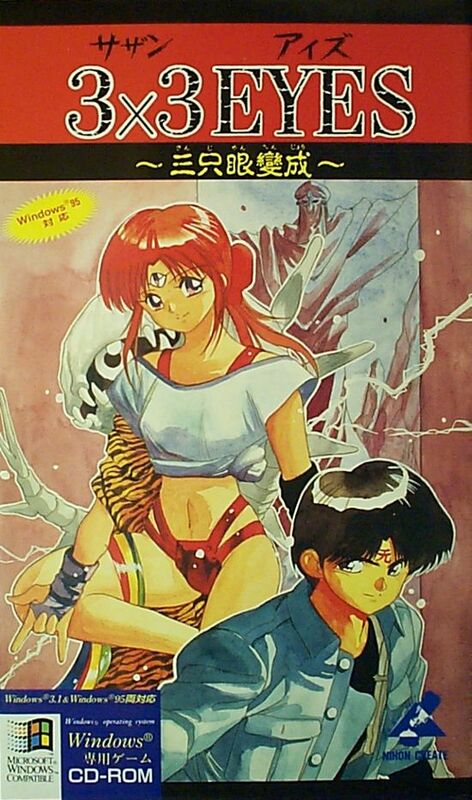 This is the third game created by Nihon Create, and the first native Windows 95 game. The game interface has been improved, and the graphics are very high quality. It comes on two CD-ROMs, and there are several mini-games such as poker within the traditional adventure game. There is also a digital comic that recaps the Sanjiyan Henjyo game, since this is a sequel of sorts. Nintendo game boxes scanned by my dad, and Saturn game scanned by me. Mega-CD, PC Engine, and Windows games photographed by me. PSX game scans taken from some game importer's web page. 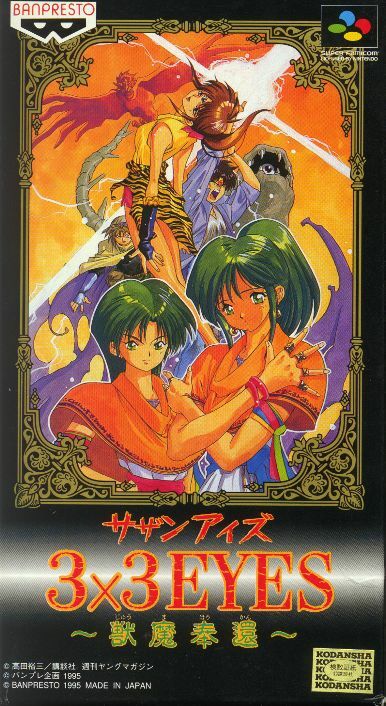 PC-98 game covers from the old Nihon Create web site.